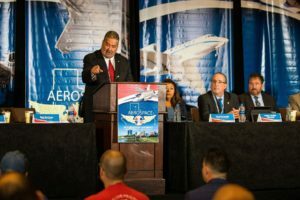 The 2018 IAM Aerospace Conference was held last week in Fort Worth, TX with nearly 300 delegates in attendance. Local Lodge President Harry Brown represented our Local Lodge at the event. International President Bob Martinez hosted the conference, which included a tour of the Lockheed Martin F35 production facility in Fort Worth. IAM District 776 hosted the Lockheed Martin F-35 plant tour and cookout that followed. Local Lodge President Harry Brown will provide a briefing about the conference to the Membership in attendance at the September Union Meeting, Thursday, September 20th.